The shipping container with Ariane 5’s “upper composite” – composed of the ESC-A cryogenic upper stage and vehicle equipment bay – is unloaded from the MN Colibri transport ship docked at Pariacabo Port in French Guiana. This component is for an Arianespace Ariane 5 mission in early June with the EchoStar XVIII and BRIsat satellites. Components for another of Arianespace’s up-to-eight planned Ariane 5 launches in 2016 are now at the Spaceport in French Guiana, following their delivery from Europe this week. Arriving aboard the MN Colibri – which is one of two sea-going roll-on/roll-off transport ships that support Arianespace’s launcher supply chain – the elements included Ariane 5’s EPC cryogenic main stage and the “upper composite” composed of the ESC-A cryogenic upper stage and vehicle equipment bay. Once unloaded from the MN Colibri at Pariacabo Port adjacent to the city of Kourou, the components were transferred by road to the nearby Spaceport. This Ariane 5 is planned for liftoff from the Spaceport in early June with two telecommunications relay passengers: EchoStar XVIII and BRIsat. EchoStar XVIII will join the fleet of DISH Network L.L.C. The high power multi-spot beam satellite will augment DISH’s existing fleet, assuring the highest level of ongoing service to DISH customers. BRIsat will serve Indonesia’s PT. Bank Rakyat Indonesia (Persero) Tbk. – also known as BRI – to provide a dedicated platform for banking connection services across the Indonesian archipelago. Its launch will make BRI one of the world’s first banks to orbit a communications satellite. Both BRIsat and EchoStar XVIII are relay platforms built by SSL, a leading provider of geostationary commercial satellites. 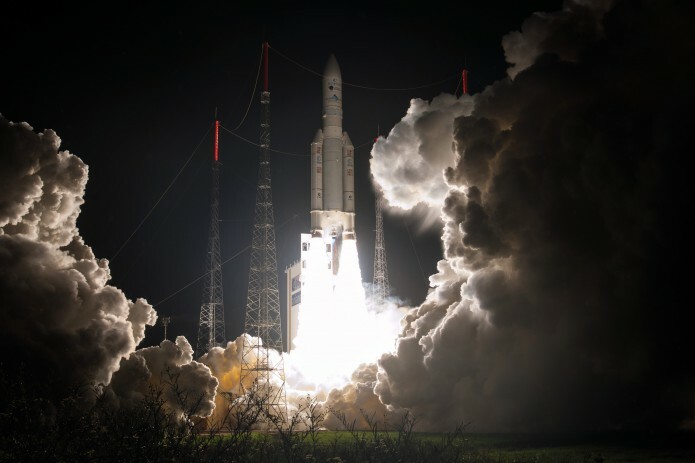 To date, more than 50 SSL-built spacecraft have been launched by Arianespace. Ariane 5’s early June mission with BRIsat and EchoStar XVIII is designated Flight VA230, signifying the 230th liftoff of an Ariane vehicle since the family of European launchers entered service in 1979. So far in 2016, Arianespace has used the heavy-lift Ariane 5 for two on-target missions: Flight VA229, performed March 9 to orbit the EUTELSAT 65 West A satellite for Eutelsat Communications; and Flight VA228 – conducted on January 27 – which lofted Intelsat 29e as the first high-throughput EpicNG-series spacecraft for international operator Intelsat. Protected by its shipping container, Ariane 5’s cryogenic main stage enters the Spaceport in a convoy that began at Pariacabo Port. The cryogenic stage will be utilized on a June heavy-lift flight to orbit the EchoStar XVIII and BRIsat satellites from French Guiana.